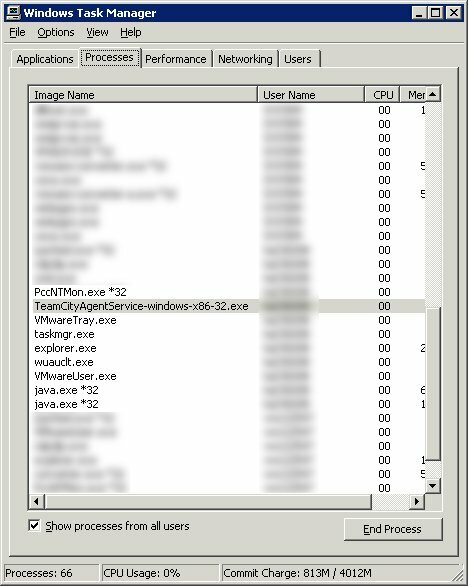 Shouldn't the agent service TeamCityAgentService-windows-x86-32, which is a 32 bit application, run under WOW64 context? I looked at the Windows Task Manager, and I was very surprised to find that the service wasn't running as a 32 bit application. Is this even possible? Please look at the attachment and notice how *32 is missing after the .exe name. Java Service Wrapper process is 32 bit process. I've checked it bitness with Process Explorer. It seems there is an issue of Java Service Wrapper that turns out to have wrong value set to that environment variable. You may workaroud it be setting env.PROCESS_ARCHITECTURE=x86 in the buildAgent.properties file.